We have created a dependable and sustainable process to grow and deliver premium quality grapevines. We employ three different methods of propagation, bare root, potted and tissue culture. We are now in the process of transitioning our source vineyards for the nursery to being certified virus free. This involves planting new “mother blocks” that have been tested to be free of grape viruses. 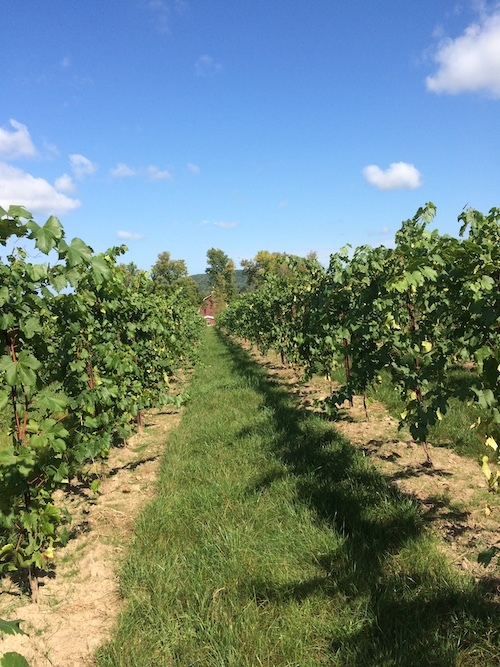 We are adopting the New York State guidelines for production of virus free grapevines, which among other requirements, calls for virus testing every source vine in our vineyard on a rotation every 4 years. We are proud of the health of the vines that we are producing here, and look forward to a productive future for our industry. As this effort is evolving over the next few years, we will post our advancements. 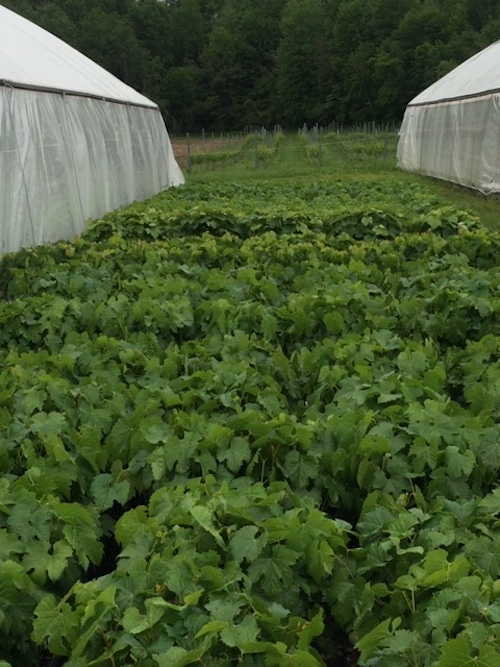 Our BARE ROOT vines make up the largest part of our nursery production. 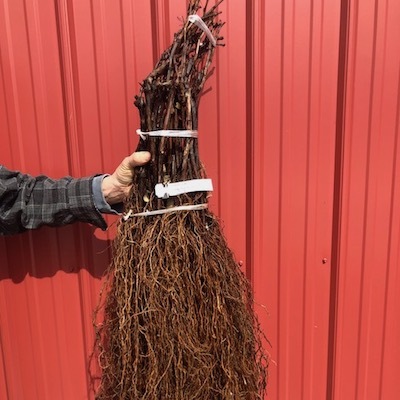 These sturdy, dormant vines are the most widely planted type of grape nursery stock as they ship easily and can endure the rigors of planting earlier than other types of nursery stock. The land that we chose to produce our nursery stock was selected to allow our vines to thrive every year. These fields are managed for the long term production and cleanliness of our stock. Every year the fields are rotated and cover cropped. The deep, slate derived, gravelly soil here allows us to weather the variable climate challenge of excessive precipitation. When the weather turns dry, the lifeline of our farm is the Mettawee River. This clean and abundant water source keeps our young vines growing smoothly as their first roots are forming. Fertility is routinely tested and managed to grow balanced and consistent vines. The backbone of our fertilizer program is organic composted chicken manure and mineral amendments. Disease and insect pests are managed using an integrated approach of conventional and organic inputs, ensuring that healthy vines enter natural dormancy in the field before harvest. During the winter, our small well trained crew prunes mother blocks that have been regularly checked to be true to variety. Hardwood cuttings are processed from these vines and stored until they are callused and planted in the outdoor nursery. These cuttings are grown for a single season in a perfect field environment of raised beds, black plastic mulch and drip irrigation. After several freezes and full leaf fall, the dormant vines are harvested from the nursery and quickly packed into a climate controlled facility. Each vine is then graded by size and structure, and trimmed to provide our customers with the most uniform nursery stock possible. Only the tops of our vines are trimmed to a single shoot, leaving the long roots fully intact. This allows each grower to decide how the roots should be trimmed before planting, if at all. Our vines are kept fully dormant in refrigeration until the day they are shipped out, meaning they are not sensitive to frost. 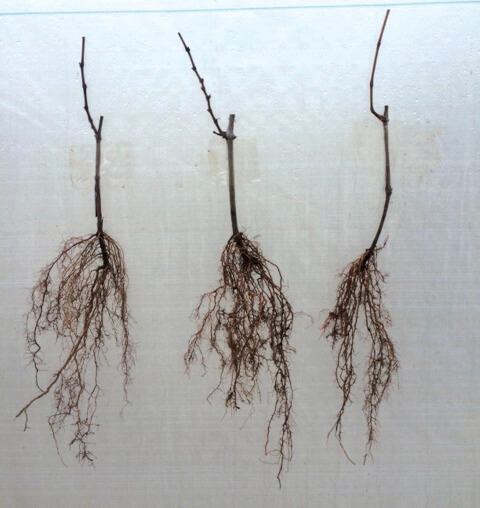 Bare root vines are ready to plant in the field as soon as the soil is workable in the spring, but can be planted as late as the first week of June in most northern locations. 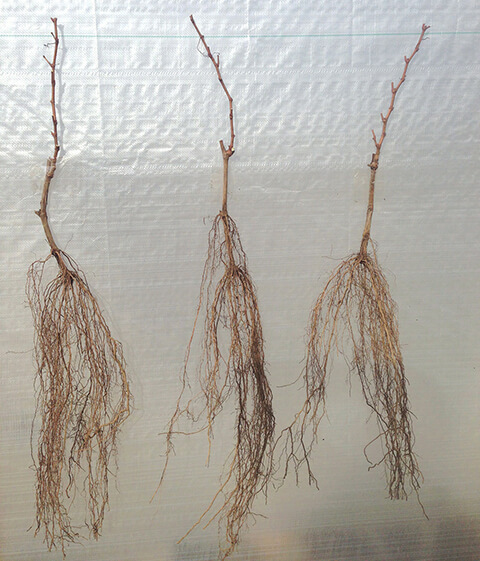 Bare root vines should be soaked for a minimum of 15 minutes, and up to 24 hours before being planted. Plant so the bottom of the original cutting is at least 10” below the surface. Our Bare Root #1 vines are our largest grade. Depending on the variety, these will have 16-24 inches of roots and the tops will be trimmed to 8-12 inches. This is the majority of what we produce and sell. Bare Root #2 vines are our smaller grade. These typically have 8-16 inches of roots and 6-8 inches of top growth. We have been producing greenhouse grown, POTTED VINES for over a decade. We know how to grow a potted vine that is ready to plant in the field the day you receive it, and then have it thrive like a bare root vine. 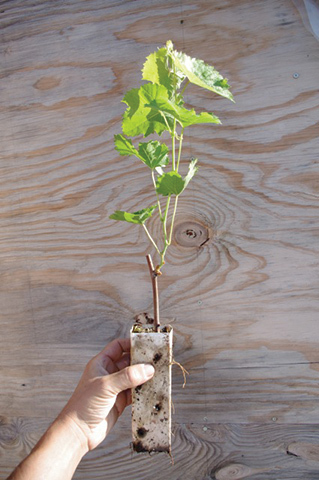 Our potted vines are grown from hardwood cuttings that are rooted in March and grown until late May, when they are hardened off to outdoor conditions. These vines are sensitive to frost as they are actively growing. They are propagated in milk carton-like pots know as plant bands. These pots measure 6 inches deep and are 2 inches wide. The pots are open on the bottom and have holes punched throughout. 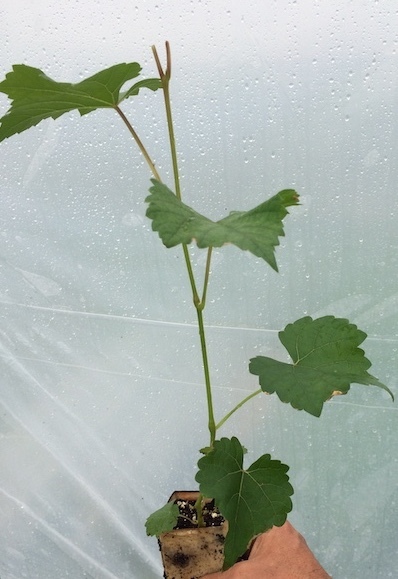 Vines will have approximately 8 inches of top growth from the top of the cutting. Overall length of vine from the bottom of the pot to the top of the new growth is 15"-18"
The pots should be submerged under water individually or as a group for several seconds to several minutes. A small hole or trench that is a minimum of 10 inches deep and 3 inches wide is all that is needed. THE POT SHOULD BE REMOVED IMMEDIATELY BEFORE PLANTING. Adequate water must be provided at planting and during the early parts of the growing season to get the vines off to a seamless and quick start. In order to bring you the newest grape varieties in commercial quantities, we began working with tissue culture propagation. This is one of the fastest ways to produce large numbers of vines from the original “mother” vine. This is also the process used to clean up vines for virus certification. They resemble seedling grapevines for the first year and so are slightly more tender than our stock produced from hardwood cuttings. These vines can reach maturity in the same number of years as hardwood stock under the right conditions.